This artist's painting technique has to be seen to be believed. We've looked at some useful painting techniques over the years here on Creative Bloq, but few compare to the impressive brushwork of Japanese artist Keisuke Teshima, otherwise known as onestrokedragon. You can get a taste of Teshima's work above. As you can see, he specialises in dragons that appear to writhe across the page. Every dragon he paints has a body made up of layer upon layer of scales that look like they've taken an age to paint. Not so. Thanks to a Japanese painting technique called Hitofude Ryuu, Teshima is able to create the intricate details of a dragon quickly and without taking his brush off the page. 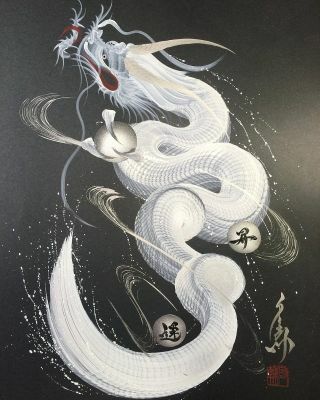 Hitofude Ryuu translates to 'dragon with one stroke' and you can watch the mesmerising art technique in action in the video below. Impressive, eh? The painting technique might be quick, but we can't help but imagine how long it takes artists like Teshima to master it. In the video you can see how steadily staggered brushstrokes create the impression of scales. The same technique is also used to realise the dragon's whiskers, and it's there that you get a better look at how Teshima's hands carefully pause just for a moment as he drags his brush across the page. When it comes to the body of the dragon though, Teshima's technique is so smooth that it's difficult to spot how he creates the scale effect. The paint just seems to emerge from his Sumi brush in slabs as if by magic. To give his dragons a sense of movement, Teshima delicately coils their bodies without taking his brush off the page or losing momentum. The way the colours are loaded onto the brush and the expert amount of pressure exerted on the page help to give the body a sense of shape. Rounding off the dragon is the tail, which sees the brush marks ending with a long sweep.